The Indianapolis Colts have officially placed Donald Thomas on injured reserve as he will miss the remainder of the season with a quad tear. This is a big deal. Thomas signed a 4 year, $14M deal during the offseason. $1M of this deal is guaranteed. Hopefully, Thomas will be back healthy for next year. In the meantime, this does open up an opportunity for 2013 3rd round draft pick Hugh Thornton. We’ll have to keep a critical eye to see how Thornton adapts on the left side of the line. Thornton was originally supposed to backup on the right side of the line – possibly spelling Mike McGlynn by season’s end. Change of plans. That is, unless the Colts swing a trade for an offensive linemen. Right now, it doesn’t sound like that is the route the Colts are going to take. Pagano addressed the situation saying, “we’ve got nine guys with Link (Jeff Linkenbach) and Khaled Holmes sitting there. As you know, the roster is fluid and it’s ever-changing because of injuries. We have options there.” Unless I’m missing something, I only count 8 offensive linemen on the roster including Samson Satele, Khaled Holmes, Joe Reitz, Anthony Castonzo, Mike McGlynn, Hugh Thornton, Jeff Linkenbach and Gosder Cherilus. Am I missing someone? Both Linkenbach and Holmes were inactive against the Dolphins. The C0lts can’t afford to keep that many linemen inactive next week. Castonzo is still gimpy and Thornton is a rookie. Khaled Holmes is also a rookie. The Colts run a serious risk of being severely overmatched in the line battle unless they keep everyone active. Even then, the lack of experience will really hurt. 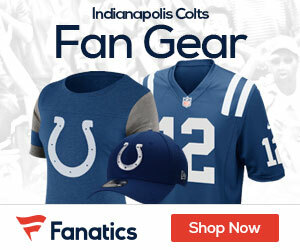 It will be interesting to see if Grigson addresses the shortage via trade or by signing someone. 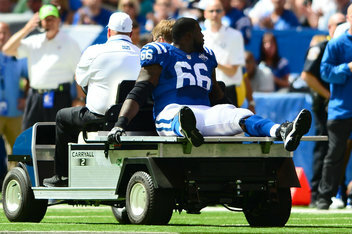 In other roster news, the Colts released Dan Moore from injured reserve. It’s likely that Moore will count a small amount towards the 2013 salary cap – perhaps as little as $48K.